Wedding Cookie Table baking continues as we approach the last few weeks until the wedding! 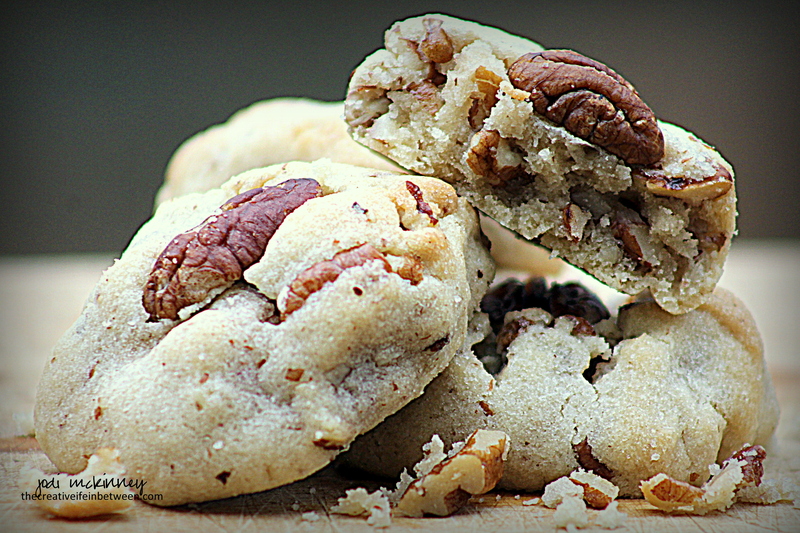 I couldn’t resist trying a Pecan Sandie Shortbread Cookie to add to the selection given that I overbought pecans for the Pecan Tassie recipe. 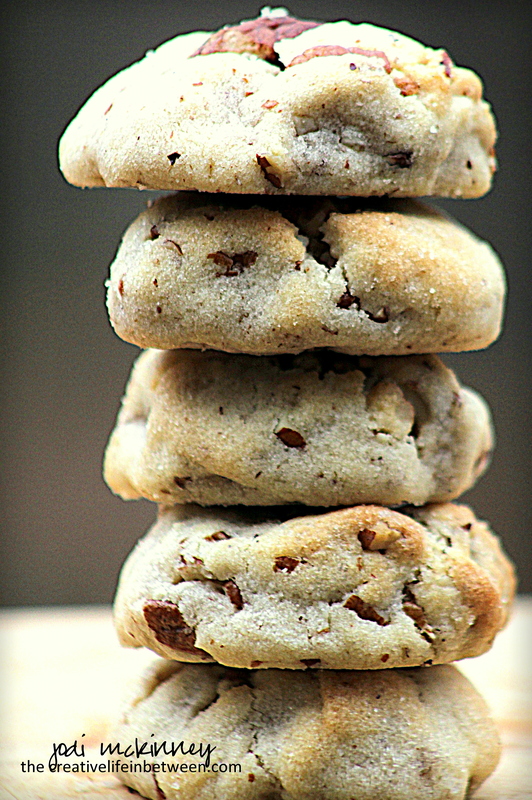 Anyone who loves Keebler’s Pecan Sandies, you are in for SUCH a TREAT with this recipe! Can I get an Hallelujah? Can I get an Amen! Hope you will give this simple, yet extraordinary recipe a try! In a large electric mixer bowl, combine softened butter, vegetable oil, and sugars until creamy. Beat in eggs, one at a time, then add vanilla. Continue beating at high speed until light and fluffy. Add cream of tartar, baking soda and salt until combined. Add four one cup at a time and slowly combine. Remove from mixer, and fold in 3 cups chopped toasted pecans. Place dough in Ziploc bag in refrigerator and chill for several hours or overnight. When ready to bake, preheat oven to 375 degrees F.
Roll dough into 1 inch balls. Roll top half of ball with sugar, flatten slightly, and add a pecan half to center. Place on baking stone or cookie sheet lined with parchment paper, and bake for 8-10 minutes until lightly golden brown. Do not overbake. Remove to cooling rack to cool. Oh – what a great breakfast and coffee cookie! Oh boy, more cookies! And pecans! I’ve never had a homemade one, pinning!!! You should open a bakery Jodi, so many fabulous cookies!! they turned out really yummy! YUM YUM YUM! Delicious, delicious! I love love love pecans! I love anything that has pecans! You’re going to have a rockin’ cookie table at the wedding! me too PJ – lovvvveee pecans! So tasty Jodi! They look perfect! 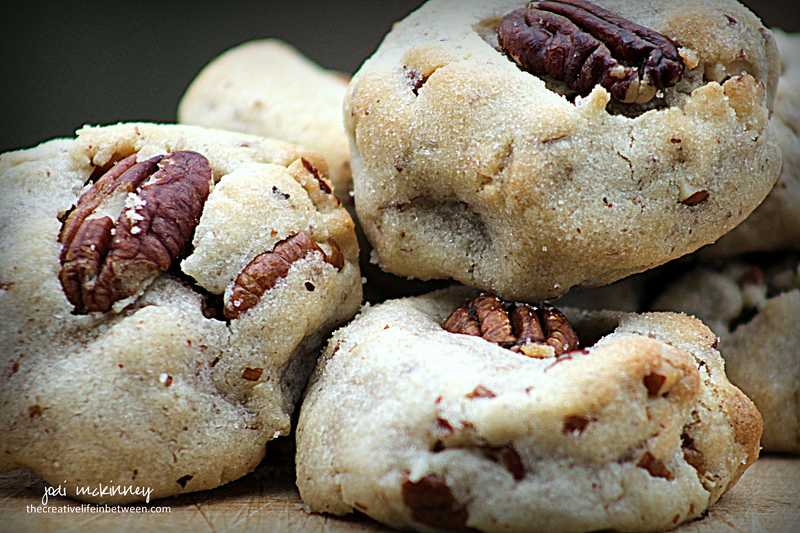 Since I was a kid, I’ve always loved the store bought Pecan Sandies. I have a sneaking suspicion that once I taste YOUR recipe, I’ll never go back to Keebler. They look and sound incredible. YUM! hope you can find some help soon. hang in there and take care!! Amen! And feel free to mail me the left overs. I love shortbread cookies and pecan sandies. These sound delicious. I look forward to trying them! What would the world be without shortbread? That wonderful buttery flavor is too difficult to resist! These look absolutely wonderful, great job! Ooh–these are definitely going on the list for a future house concert. I cater these intimate musical events that a friend hosts every few weeks, and one of the food highlights is freshly baked cookies that come out of the oven at intermission.